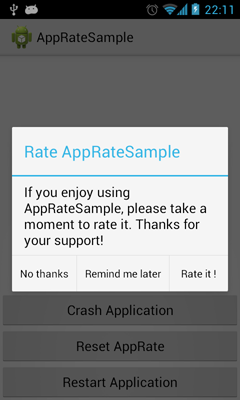 AppRate allows your users to rate your application. 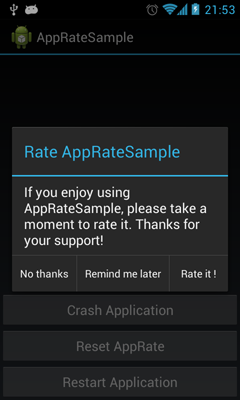 AppRate shows a customizable rate dialog according to your chosen settings. Put the AppRate jar in your libs folder or add AppRate as a library project. You can decide not to prompt the user if the application has crashed once. You can decide when to prompt the user. You can customize all the messages and buttons of the rate dialog. You can set your own click listener.